My wife and I were given a 2 night stay in South Lake Tahoe this weekend (thanks Judy!). I somehow convinced my wife to go up with the kids early Friday afternoon so I would have to drive separately and have my own car for some astrophotography. 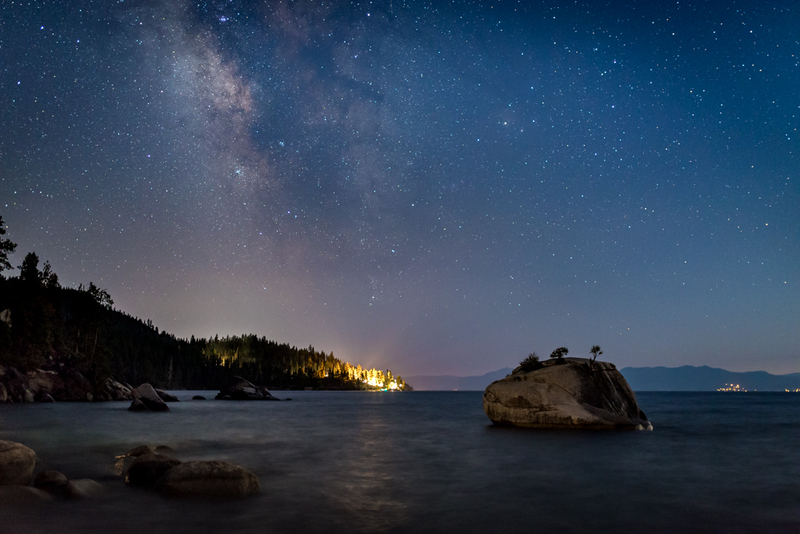 Bonsai Rock, on the east shore of Lake Tahoe, is a great location to see the Milky Way during the summer, but the high water level made it difficult to get the composition I wanted (just Bonsai Rock with the Milky Way going straight up over it). I opted for a shot much earlier in the night which included more shoreline. Whether it was the shot I wanted or not, it was still nice being out shooting the Milky Way and spending a great weekend with family. Happy 7 year anniversary (tomorrow) honey!